Are the PhysioSuite MouseSTAT Pulse Oximeter Sensors CT compatible? Are there limitations to using room air with the SomnoSuite? The SomnoSuite can be used for long surgeries with room air (up to 6 hours). Yes, you can have one analog output or output all parameters digitally. Can I use my Kopf anesthesia adapters with my SomnoSuite? Yes. The mask must be slid up the incisor bar to fit against the muzzle tightly. Can I use the SomnoSuite anesthesia mask during ocular procedures? Yes. The membrane on the anesthesia mask can be easily cut and shaped as to not interfere with procedures involving the eye. We also can manufacture custom nose cones. Can the MouseSTAT measure SpO2 on 7-day-old mice? Yes, you can use the 4 mm paw sensor or try using the Y-Clip sensor as a whole body sensor. Can the MouseSTAT Pulse Oximeter be used on awake animals? No, the MouseSTAT Pulse Oximeter and sensors are designed for use on anesthetized animals. Can the MouseSTAT settings be manually set? Yes. You can choose from either a manual setting or allow the MouseSTAT to automatically set your respiratory rate and tidal volume. To use the automatic setting, enter the animal’s weight and press run. To manually set-up the ventilator, adjust the settings within the configuration menu, see the User’s Guide for additional details. Do I need a pressure reducer to use compressed gas with my SomnoSuite? The SomnoSuite requires a gas input of 5-10 psi. You can use a pressure regulator provided that it is capable of reducing the output of your gas source to 5-10 psi, or you can use a Pre-Set Pressure Reducer. Does the system include a bottle regulator? Does the system include a vaporizer? Yes. The vaporizer is included with the system and is “mouse-sized” as oppose to the large human-sized units. Does the system include anything for scavenging? Yes, an F/AIR Canister is included with each system. Does the unit connect to a gas supply? Yes. You can use room air of an external gas supply that connects to the back of the Mouse Anesthesia Suite. How does the RoVent operate in both constant volume and constant pressure modes? 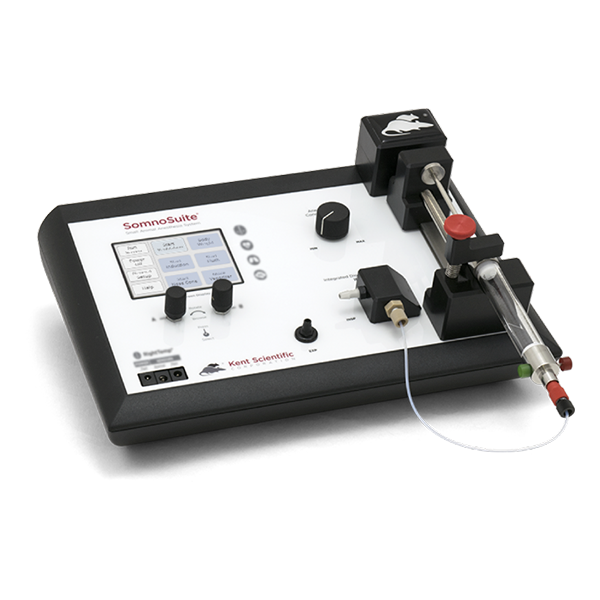 The RoVent operates in either a constant pressure or a constant volume mode. When in the constant pressure mode it will report the tidal volume delivered. When in the constant volume mode it will report the airway pressure generated to deliver the volume and functions like a standard volume ventilator. For animal safety the volume mode has both minimum and maximum pressure settings. Regardless of the volume delivered, a minimum airway pressure has to be attained so the animal will be ventilated at a minimal level. Also, regardless of the inspiratory volume, the airway pressure will not go over the maximum pressure setting, thereby protecting the animal from over ventilation. Minimum and maximum pressure are set by the user. How long will my filled syringe last in constant flow mode? How many rodents can the SomnoSuite anesthetize? How portable is the SomnoSuite? Extremely portable – similar in size to a laptop computer. The internal pump and optional battery allow you to use room air to mix with your anesthetic. The battery allows you mobility. Interested in a complete SomnoSuite set-up? Your anesthesia set-up is dependent on your research study protocol. To help you identify your anesthesia accessory needs, please fill out our Sales Support form. Is the SomnoSuite compatible with my stereotaxic system? Yes, the SomnoSuite is compatible with stereotaxic systems. Please contact Kent Scientific with the model of your Stereotaxic Gas Anesthesia Mask, and we will be happy to provide compatible tubing for you. What are the dimensions of the SomnoSuite? What are the fittings and hose sizes? The fitting size is 1/4″ and the tubing is 1/4″ x 3/8″ PVC. What can I use to clean the controller? Standard lab disinfectants should be used to clean and disinfect the controller. What type of scavenger is recommended? The provided Charcoal Waste Gas Canister. There is no need for a hood fume or special room evaluation system. When priming the syringe, how much anesthetic is required to fill the tube from the syringe to the vaporizer block? Where does the isoflurane go? Once the isoflurane leaves the syringe, it travels down the Anesthetic Delivery Tube into the Integrated Digital Vaporizer Block. The anesthetic vapor travels out the INSP port for delivery. It will then flow back into the EXP port on the front of the SomnoSuite, and out the back through the Exhaust port. An F/AIR Canister is included with each system for scavenging. Which syringe size should I use? Kent Scientific recommends the smallest syringe size that will accommodate the duration of your application. As the SomnoSuite operates at very low flow rates, the use of a smaller syringe will yield more accurate and uniform anesthetic delivery. For best precision, response and the accuracy of anesthetic delivery, we recommend that the syringe last 4-6 hours, which is attainable for a 30 g mouse with a 2 mL syringe. For the same animal, a 5 mL syringe usually gives acceptable delivery while potentially lasting 10+ hours. For the same animal with a 10 mL syringe, the syringe pump is running very slow so the delivery of the anesthetic will be more pulsatile. Given that the response time of the animal to changes in anesthetic tends to be in the order of a few minutes, the user may feel that the pulsatile delivery with the 10 mL syringe may be insignificant compared to the potential of 20+ hours of anesthetic delivery before a filled replacement is required. We leave this decision up to the user. Why should I decrease the flow rate? A lower flow rate leads to significant cost savings! Less isoflurane will be used and less charcoal canisters are required for scavenging1,2,4. A lower flow rate can decrease personnel waste gas exposure1,4. Using a lower flow rate can be beneficial to the animal’s health. High flow rates promote hypothermia and drying of the respiratory tract1,4. A low flow rate can improve the accuracy of physiological monitoring. High fresh gas flows can cause false low ETCO2 values due to sample dilution1,3. Carroll, G. Small Animal Anesthesia and Analgesia. Blackwell Publishing, Ames, IO (2008). Damen, F.W., Adelsperger, A.R., Wilson, K.E., Goergen, C.J. Comparison of traditional and integrated digital anesthetic vaporizers. JAALAS. 54 (6), 756-762. (2015). Marshall, Melissa. Capnography in dogs. Compendium, Boston MA (2004). Tranquilli, W.J., Thurmon J.C., Grimm K.A., eds. Lumb and Jones’ veterinary anesthesia and analgesia. John Wiley & Sons, Hoboken, NJ (2013). How can I upload data to my computer from the PhysioSuite, CODA Monitor or SomnoSuite?